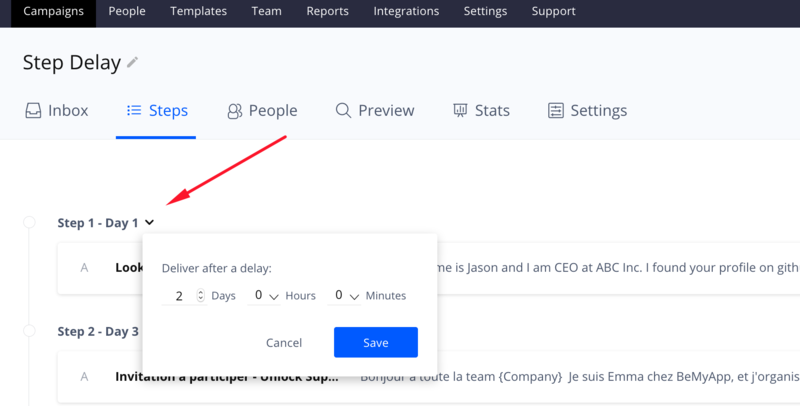 Learn how to tailor the step delay - the interval between your Reply campaign touch points - and choose between default and custom delay. Step delay is a time interval, which determines the delay between the previous and next campaign steps. For example, you can configure your campaign to launch the next step in 2 days after the previous step finishes. Open the Campaigns page and click on the campaign you want to configure. Open the Steps tab in the campaign. Click on the arrow near the step to open the dialog window. 4. Set the delay time and click Save. Note: the contacts that are already on the step where you have set the delay will ignore it. Weekends are included in the day count.